The SATCO® 3 Series Large Capacity Harvesting & Processing Heads have been designed around the robust and successful SATCO® 630 Felling Grapple. The 3L2T is the ¾” topsaw model within its own chassis. The 3L2, with an option to fit a SC100 404 Topsaw (3L2SC), is a fall and trim version with measuring. It has been designed to enable contractors to replace static-delimbers, by utilising one machine to both fall and delimb stems with the option to measure. This reduces machinery requirements and operating costs. The idea with the 3L2 is that you can cut a tree down and delimb it on the spot making the tree lighter, cleaner and more cost effective to pull to the processing site. Up to 15% of a trees weight is in the limbs so leaving them in the stands means that you get great fuel savings with faster processing times while leaving all of the waste out in the stands where it will break down and re-fertilise the soil. Clean stems to the skid for easy cut to length. Measuring systems on the SATCO® 3L2, 3L2SC and 3L2T run a large 30cm (12") diameter length measuring wheel, the larger the wheel the better it runs over the stem. There are three levels of measuring control options available: SATCO Plus 1® which is designed and supported in house, the other two options are DASA5 PRIO and DASA5 Optimising. 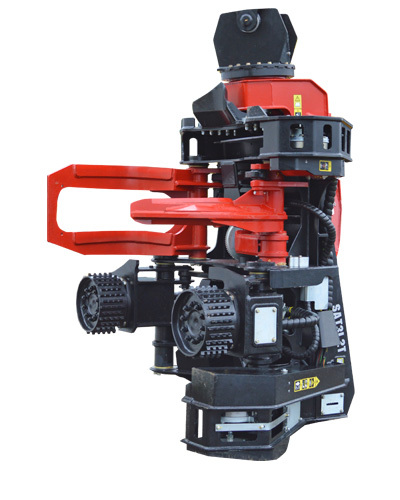 The SATCO® 3 Series Large Capacity Processing Heads 360 Degree continuous rotation allows felling in any possible direction in relation to the base machine. There is a unique ‘hose through centre’ connection to the base machine which allows the hoses to travel through the centre line of the attaching pins. This prevents the hoses over–bending causing premature failure and protects the hoses from damage, especially in tree felling applications. The SATCO® 3 Series saw unit is supported by a large 30cm (12”) diameter slew bearing making it a very robust unit especially when falling. The saw unit uses a 43” bar with ¾” chain with SATCO® auto chain tensioning. SATCO® also use a unique locking system for the saw sprocket to prevent broken drive shaft keys and a damaged saw motor. The SATCO® 3L2T has two ¾” saw units. Weighing from 3580kg (7893lbs) - 4100kg (9020lbs), and requiring 380lpm (100gpm) (US) of oil flow. The SATCO® 3 Series large capacity processors can be pinned on to any base machine in the range of 24–40 tonne. These processors are constructed using high grade materials and manufactured using the best robotic welding wire for a far superior weld.